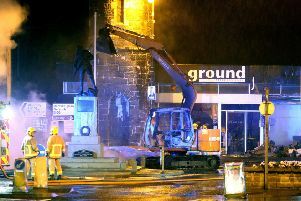 Police say arsonists showed “no regard for the safety of the community” after five cars were destroyed in Carrickfergus on Tuesday morning. Officers on patrol on the Woodburn Road discovered the vehicles on fire at business premises around 2.00am. Northern Ireland Fire and Rescue Service responded with two appliances tackling the blaze. A NIFRS spokesperson said the “deliberate ignition” incident was dealt with by 2.50am. Police are investigating a link with the attack and ongoing tensions in the town. Inspector Michael Simpson said: “Those responsible have shown no regard for the safety of the local community in carrying out this reckless act. At the start of November, elected representatives were united in their condemnation of violence which saw attacks on homes and a business, including the torching of five cars at Woodburn Road - the same location targeted again this week. The PSNI is appealing for anyone who saw anything suspicious in the Woodburn area early on Tuesday to contact them on 101 quoting reference 72 of 27/11/18. Alternatively, information can be provided via Crimestoppers on 0800 555 111.